not stored on Airmail locally). contains “paul” in the ‘To:’ field. contains “paul” in the ‘From:’ field. which contain either “paul” or “steve” in the “To:” field. — You can search the messages by content also. Just type in the part of the content in the search field. For example: searching “let us meet this weekend” will result in a message list, which has all the messages that contain ‘let us meet this weekend’. How to search the messages only in a particular account? 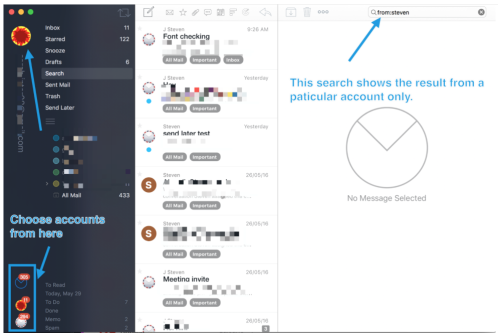 How to search all the accounts/database of Airmail? Please note that to search in a specific message press &apos;CMD+Option+F&apos;.